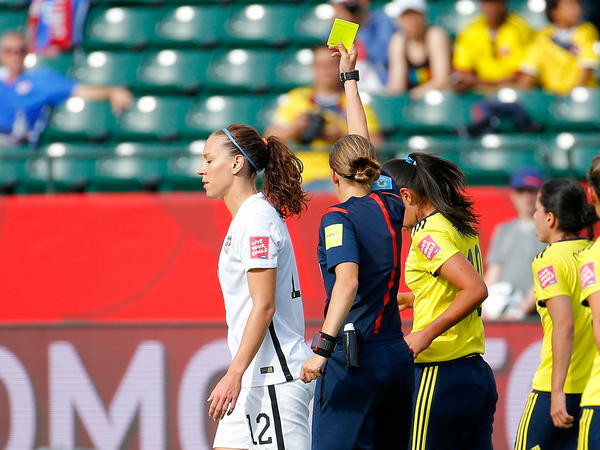 Lauren Holiday of the United States is given a yellow card Monday in the first half against Colombia in a Women's World Cup match in Edmonton, Canada. She also received one in an earlier match against Australia, so Holiday will be suspended for the Americans' next match. American forward Alex Morgan scores her first goal of this year's Women's World Cup on Monday against goalkeeper Stefany Castano of Colombia. The U.S. won the match 2-0. 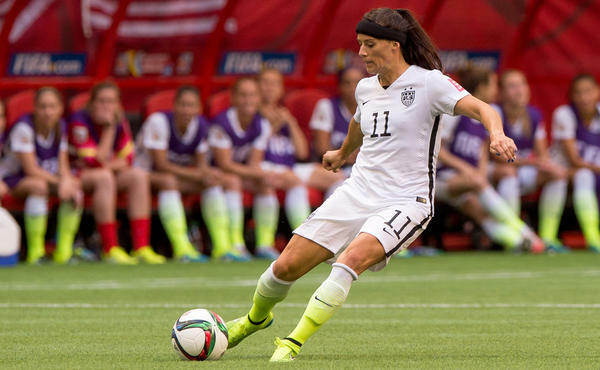 Defender Ali Krieger sends the ball during the Americans' final Group D match last week against Nigeria. 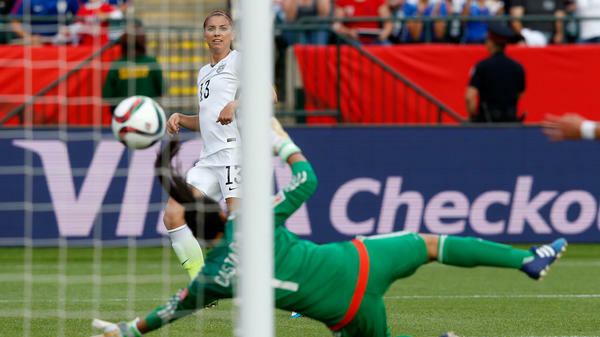 The U.S. won the game, 1-0, moving on to the knockout round of the Women's World Cup. The U.S. beat Columbia 2-0 Monday night behind second-half goals by Alex Morgan and Carli Lloyd, the latter off a penalty kick. Colombia had only 10 women on the field for most of the second half after goalie Catalina Perez was issued a red card. Morgan's first goal of the tournament comes in her second start; the injury-hampered forward came off the bench in the team's first two matches. Rapinoe and Holiday, both of whom were carded against Australia earlier this month, have both started every game of the tournament for the Americans, but won't be available when the team goes up against China on Friday at 7:30 p.m. ET. The Chinese squad was the 16th-best in the world in the most recent FIFA rankings. Colombia shocked third-ranked France 2-0 in group play (arguably the biggest upset in the opening round). Australia stunned Brazil 1-0 on Sunday to advance to the quarterfinals. The U.S. placed first in its group; Colombia third. On paper, the U.S. should win and is heavily favored. Colombia has never beaten the U.S. (and hasn't even scored a goal against the Americans). Colombia won't have its starting goalkeeper. Sandra Sepulveda was suspended after receiving her second yellow card of the tournament. None of that has slowed the trash-talk. Colombian star Lady Andrade told USA Today that Colombia would still win: "We're going to beat them since they like to talk so much." The last time these two teams met, there was controversy. In the 2012 Olympics, Andrade punched U.S. forward Abby Wambach in the face, giving her a black eye. Andrade was suspended for two games. The U.S. hasn't lost during this World Cup. But the team still hasn't hit its stride this tournament, either. Head coach Jill Ellis has tinkered with the starting lineup in each of the three games so far. The defense, led by Julie Johnston (and Hope Solo, of course) has looked the best for the U.S. Up front, Ellis has struggled to find the perfect formula of speed, agility and team cohesion to score goals. (Christen Press, Abby Wambach, Sydney Leroux and Alex Morgan have all had starts.) The U.S. dominated Australia in their opener, winning 3-1. But the Americans struggled against Sweden with a scoreless draw, and a tight 1-0 victory over Nigeria. But that doesn't matter now. It's the knockout round of the World Cup. The winner advances to the quarterfinals, and the loser heads home. Kickoff is at 8 p.m. ET. You can watch the game on Fox Sports 1 and NBC Universo.